Who is your real self? If you’re not sure, how do you discover it? And why does finding it matter? 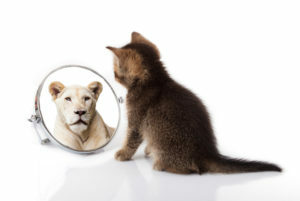 When we are confident that we can trust ourselves to take care of ourselves in challenging situations, we experience a sense of safety, and the natural outcome is the ability to be more vulnerable. We can only get in touch with who we really are when we are at our most vulnerable. We are never more powerful than when we are completely vulnerable and have nothing to defend. In those moments of vulnerability we are real and in touch with the best of ourselves. The world can be a scary place, especially if we’re not confident in our ability to take care of, and manage, ourselves. In order to feel safe, we must first be able to trust that we can take care of ourselves. To be clear, I’m not talking about truly dangerous situations. I’m talking about our day-to-day lives wherein we walk around unknowingly armored in protective, automatic defenses. Most of us have been conditioned to attempt to control everyone around us, in an effort to reduce our discomfort or to get what we want. What we need to do is leave them alone. Then we can begin to increase our own self-management skills. When we feel confident that we can manage ourselves respectfully, we will more wisely handle most external challenges that present themselves. Whether we need an assertiveness class, a therapist, a trip to the library, or a Google exploration to start familiarizing ourselves with what it means to self-manage, it is never too late to learn. There are books and podcasts on every subject under the sun. I just Googled books on self-management and got 721,000,000 results. Once I trust myself to manage and take care of myself responsibly, I automatically feel safer. Safety is a missing ingredient in many failing marriages, deteriorating relationships between parents and children, and superficial, shallow relationships with our friends, co-workers and other family members. When we don’t feel safe, what do we do? We engage in fight, flight, or freeze. And those behaviors can express in a variety of ways. We pull from an arsenal of automatic defenses that we have been perfecting for years. We resort to cynicism, grandiosity, distancing, stone-walling, name-calling, self-pity, guilting, denial, compartmentalization, projection, repression, rationalization … I could go on with more and more sophisticated clinical terms. You get the picture. When we trust ourselves and feel safe, reactivity is reduced and the ability to observe our own behavior, and modify it beneficially, is increased. Our need to resort to automatic defenses is reduced because we trust our real selves to handle the feelings that inevitably arise when the defenses go down. When we trust ourselves and feel safe, we can learn to experience and handle uncomfortable feelings, which is the essence of vulnerability. Vulnerability is a natural outcome of trusting ourselves to manage ourselves, combined with a growing sense of safety that we experience as we practice those self-management skills. If we don’t allow ourselves to be vulnerable, we may fail to realize the intimacy and depth of our most valuable relationships. This is why we challenge ourselves to find our real selves. Because offering anything less in our relationships shortchanges them and it shortchanges us. As a starter, allow yourself to sit with how you think you’re doing in any of the three areas: trusting yourself to manage yourself rather than others, creating a sense of safety for yourself and others, and allowing yourself to be vulnerable with the people who matter the most to you. I know this is a big topic, and I’m not offering a step-by-step guide to finding your real self. You have the rest of your life to play with this stuff. What matters is starting, and the only place you can start is exactly where you are at this moment. Tara Brach has a podcast on vulnerability and intimacy. You can find it here. The School of Life posted a short article on taking the pressure off of love, which automatically encourages us to be more real. Find it here. Brene Brown speaks to vulnerability in her book: ‘Rising Strong’. Self-management in communication: ‘Non-Violent Communication’ by Marshall Rosenberg. It has been around for years.